Caps Basketball: The NHL Lockout Stinks! We Need Your Help! The NHL Lockout Stinks! We Need Your Help! Hey everyone! The "season" is fast approaching and with every new story that comes out it seams that the season may not be fast approaching. The players and ownership are looking like the season could be pushed back (or never happen) due to a lockout. I'm going to need your help, so if you don't want to read my hockey fan story, then skip to the bottom! As someone who started watching hockey just last year you would think that this would not be a problem. Just pretend last year didn't happen and go back to watching replays of Wizards losses on nights when the Caps were supposed to play. However, something happened last season. Something that can not be undone. I became a hockey fan. I watched every game, I lived and died with every goal and goal against. I went to games, I wrote about games, I learned about hockey, and I even almost went ice skating once. I even have a Caps shirt...that I bought! (I never actually bought any Wizards/Redskins/Nats shirts before). What is going to happen if there is a lockout for the NHL? Well I'm going to be quite mad. I'm not going to start a Caps Basketball Soccer blog and cover DC United. I'm just...not. I want my hockey. It is not fair. Hockey made me like hockey and they are going to take it away!? NO! NOOOO! But what can I (you) do! I know that most of you who read this are feeling the same anger and frustration about possibly missing the NHL season. In fact you are probably much more upset than me. I'm a rookie. So don't just sit there in your room crying and eating ice cream! Speak up! Send us your pictures (like the ones above) of how the lockout has affected you. Pics of signs you made, posters, chalk boards, computer screens, or anything you feel gets across the point to the NHL players and owners that they should stop F'ing around and start signing some papers. Pics of you crying, pics of you in the hospital, or however the lockout hurt you. 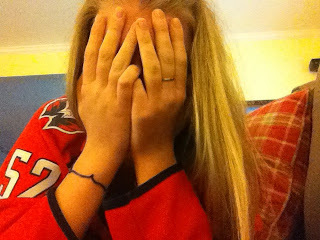 We are going to use te photos in a anti-lockout video, so send them in and get in on the fun! Be sure to have your team jersey on when you take the pics! PS: If you have a picture of your pet wearing Caps stuff, send those in too!